The Florida Project - Blu-ray Review - ReDVDit! The Florida Project is a 2017 American drama film that was directed by Sean Baker and written by Baker and Chris Bergoch. It features Willem Dafoe, Brooklynn Prince, Bria Vinaite, Valeria Cotto, Christopher Rivera, and Caleb Landry Jones. 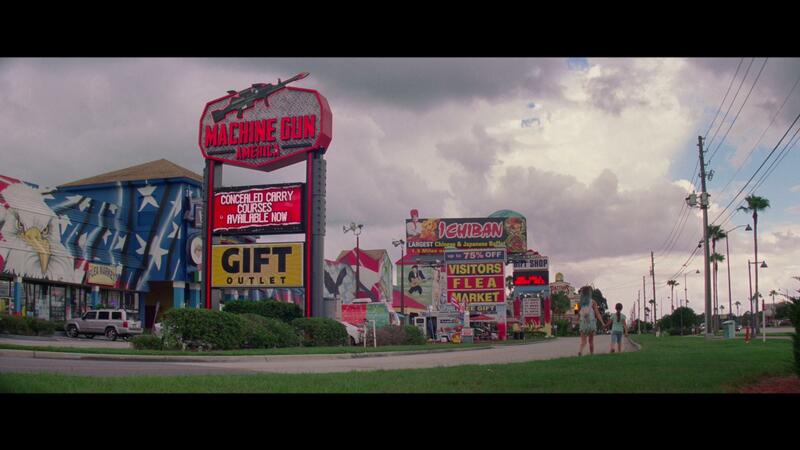 The plot follows a six-year-old girl who is living in a motel with her rebellious mother in the Greater Orlando area as they try to stay out of trouble and make ends meet. The title is derived from the early name for Walt Disney World; located near the setting of the film. The film premiered in the Directors’ Fortnight section of the 2017 Cannes Film Festival, and was theatrically released in the United States on October 6, 2017, by A24. It was highly praised for its performances (particularly that of Dafoe) and Baker’s direction, and was chosen by both the National Board of Review and American Film Institute as one of the top ten films of the year. Dafoe earned Best Supporting Actor nominations at the Academy Awards, Golden Globes and BAFTA Awards. I went into The Florida Project completely blind; however was really, really looking forward to it given A24’s past in releasing quality films. That said, my wife and I both really loved this film. The story not only takes you into the lives of these people who had obviously made some bad choices in the long run and have found themselves living out of a motel; but, the lives of these children who are affected by these bad decisions and how they are trying to make the best of their situation and really be children. The bond between Moonee and her friends Scooty and Jancey as they venture out into the other areas of their little neighborhood really showed how they not only relied on their personal imaginations, but the imaginations of each other to make the best of their current situation. I did have one problem with the attitude of Moonee as the story progressed, as she occasionally would display a complete and utter disrespect for adults, including her mother. The overall lack of discipline that was seen in raising this child was really off-putting. And I can’t really fault Moonee or the other children for their lack of respect for others because, in reality, look at how their parents acted throughout this movie. The Florida Project was absolutely beautiful as it played out across my living room television. Every aspect of not only the life situations that Moonee, her friends and the various parents were stuck in because of their life choices were beautifully represented throughout; but as you watch this film, the beautifully done camera work does a great job at putting you right into the imagination of the children that are living in these various motel complexes. While Halley is doing whatever she can to make ends meet, this film beautifully portrays these children really making the best of what they have, allowing them to live their lives as children and not be forced into responsibilities that they would be too young to properly handle. 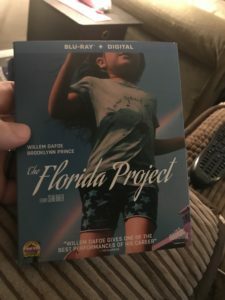 Packaged with an English DTS-HD Master Audio 5.1 audio track, The Florida Project did an absolutely beautiful job at placing my wife and I right into the middle of this story. While the track isn’t nearly as immersive as it could have been, the movie doesn’t really call for the inclusion of the surround channels to be used as the camera follows the primary characters. Dialogue is clean and clear and able to be understood without having to manually adjust the volume levels throughout; and one of the things that really stood out with this sound track was the vocal tones that were used within the dialogue. You can audibly hear and understand the struggle that Halley and the other parents are going through to be able to provide for their children; as well as the overall sense of adventure and joy when something worked out in favor of the children as the parents were trying to do something nice for their kids. 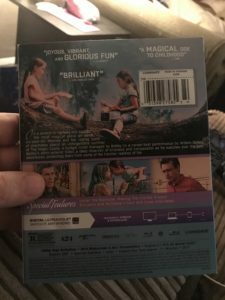 The Florida Project comes packaged in your standard single disc Blu-ray amaray case. Within that case is the standard Blu-ray copy of the film, the disc bearing absolutely no artwork whatsoever outside of the standard release text and the forever unenthusiastic blue background. There are no DVD copies included with this release; however, a digital copy redemption pamphlet. A slipcover has also been provided during the initial print run of this film that features the same piece of art that’s made available on the case art. I am beyond grateful that A24 and Lionsgate Films gave us the opportunity to check out The Florida Project. While this isn’t necessarily a film that I would have checked out upon its release, it’s definitely one that I thoroughly enjoyed and would have picked up at some point. The story does a really great job at grabbing its audience and putting them right in the middle of the lives of these people who are ultimately struggling to make the best of day to day life. The visual and audible presentation of this release was beautifully done and did a really great job at conveying the story that they had intended to tell. There are a few special features that have been included do a really great job at exploring the film further. And to add, just one small comment, that final scene that was shot using an iPhone within the Magic Kingdom park, I only share this gif in response to the directors decision to go this route; it was absolutely beautiful. If you’re on the fence about picking this release up for your collection, I would absolutely recommend grabbing it. The Florida Project comes out on Blu-ray and DVD today!